It’s a point I consider often. Art and, more specifically, how your appreciation of it can be enhanced by having some knowledge of the person who creates it. I tend to think it breaks down in one of two ways and which way it goes largely depends on the Art. If it’s not Good Art, then the knowledge of the person adds a specific burden to it. A requirement to be kind, perhaps dishonest, perhaps kindly dishonest. I know you, you’ve made Art, I don’t think all that much of it. So what do I say to you? I want to encourage you, to be your friend but, hey, it ain’t all that great. The upside? Well the upside far-outweighs the downside. When you see Art done by someone you have some knowledge of, and it’s Great, and it’s Bloody Great, then the Art is enhanced a number of times over. It’s wonderful. I’ve never met anyone from the band Sweet Billy Pilgrim, not in person, but I’ve been talking to some of them for some years now. Yes, of course I’m talking about Social Media, the wild animal that is as valued by its users as it is reviled by its non-users. I’ve talked with some members of Sweet Billy Pilgrim quite a bit, enough to know them to be smart, funny, moral, deeply-human, talented, dedicated, grounded and, well… sweet. In among a number of nice things people have recently tweeted about me, someone called me ‘unassuming’. I think that’s a word that actually describes me quite well. I don’t tend to ever assume much, especially in terms of friendships-and-such. So I can only say I feel I am friends’ with some members of Sweet Billy Pilgrim and, without assumption, I hope they are ‘friends’ with me too. So this, then, is a prime example of what I’ve been saying for some time. That Good Art is that bit better when you know the Artist. 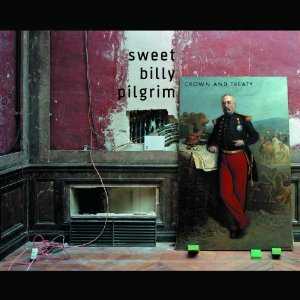 Sweet Billy Pilgrim have a new album out called ‘Crown and Treaty’. I like it very very much indeed and this liking is deepened by what little I know of the good folk behind the sounds. Would I have found this album if we hadn’t ever exchanged words? It’s tricky to say. Possibly not. I tend to move in very restricted musical grooves - pretty eclectic, yes – but also pretty limited in its own way. I like what I like and I am lazy about moving out into new musical realms. This tendency is worsened by the fact that I don’t often like new things at first-hearing. It takes me time to adapt and fall in love with something new. This also means that, when I find something I really like, I tend to cling to it and never let it go. So, no, it’s fair to say I might not have found this album, not this early in its lifespan, at any rate. And, supposing I had found it, and had not known any of the people involved? Would I have liked it still? That is much much easier to answer. Yes. I would have loved it. As I do. I would have loved it. Because it’s Great, you see. It’s brave and moving and engaging and inventive and I feel considerably better whenever I listen to it. Bad Art by Friends can make you a slightly lesser person than you are. It can make you practice avoidance and deceit in the name of friendship, it can bring you down. Thankfully the converse is also true. Good Art by Friends raises you up. I suppose I should say something about the music rather than speak in fancy generalisations all the time. That’s what the music-press do, isn’t it? They draw comparisons and pick out moments to illustrate their points. Sometimes reviews feel like an exam answer, “I think this and here’s the bit that made me think it.” I’m not sure I am equipped to do that. My response to music is not really set on a verbal level. It’s the same with visual art. I am sure there are words which would reflect my reactions. I am even sure that I know those words. I’m just not sure which ones they are or what order they go in. There’s certainly a fun game you can play with this album. A sort of ‘Spot the Influences’ thing. I can’t help do it myself. The music is so utterly original and yet it seems to nod, now and again, to things which have gone before. I could sense Thom Yorke, in places, Tom Waits, Mark Isham (in early Wyndham Hill days), Pink Floyd, Blue Nile, on-and-on. I bet you could find your own, if you listened. Come and play. Lyrically, too, it is beautiful. Off-beat, informed and never-ever obvious. I know more about words than music, perhaps, and this stuff gets me in that regard too. So may I recommend this album to you? Can I give it five stars like most of the real music reviewers have already done? Not because I’m trying to get a sale-or-two for people I know a little about or neither because I’m trying to ingratiate myself with them. None of the above. Just because I like this album a lot and I think you might like it too. Seek out a bit of it, on YouTube, at the bottom of this post, or streaming somewhere and see what you think. I have quite a number of online friends who I owe reviews to. Friends who, by continually making Good Art, and by my knowing them a little bit, make my life more full and more fun. People like Jim and Andrea and William and Rachel. I jumped to Sweet Billy Pilgrim because they are in my head now with their wonderful new music and it helps to write about what’s in my head. It can work both ways. I know when Andrew Motion’s biography of Larkin came out many people found themselves reassessing working they had previously loved without question. All they probably knew about him before is that he was a bit private and dour but the poems told them that anyway. I find having studied Beckett extensively over the last twenty-three years that it’s impossible to recapture the magic. When I first saw Waiting for Godot performed by Max Wall and Leo McKern I was blown away. I didn’t get a fraction of it but none of that mattered. Beckett has now become a thing to be studied and not relished. I have refrained from looking too closely at his later prose works because at least there I can keep some slight distance. Reviewing works by people who are known to us is hard. Not just because we don’t want to spoil a friendship but because we have to accept we might lack objectivity. I’m working on the second poetry collection by Jessica Bell at the moment (or trying to) and it is terribly hard work. Give me the latest Ismail Kadare any day. When I reviewed her first novel I spoke my mind. I didn’t connect with it and said why. I defended her choices but I refused to gush over a book I struggled with. To her credit she took it on the chin and we’re still friends and I felt no reluctance from her when I said I’d be willing to look at her poetry again; to be fair I did really enjoy her first collection but then this is the ‘difficult’ second collection. If you never got round to reviewing Milligan and Murphy I could live with it. You’ve already been of great service to me there although my wife did pick up on something you missed: the use of ‘yes’ and ‘no’ and I had to go through and excise all of them; Irish has no single words for ‘yes’ and ‘no’. As soon as she pointed it out I could have kicked myself. I’d just read The People of the Sea and Thomson so perfectly captures the Irish syntax from that time period. I had a listen to a few tracks by Sweet Billy Pilgrim. None of them really grabbed me but there was one, ‘Truth Only Smiles’, where I thought I heard a flavour of Tom Waits. The lead singer is a bit soft sung-en(?) for me. Like Jon Anderson. Could never get into him either. I think I would have been a big Yes fan otherwise. Sorry about the 'Yes' and 'No' thing. I'm afraid the Irish Language has never been a strong point with me and my years in London drummed out what little I had ever learned. I feel I need to re-read M and M to write sensibly about it and, between Castlebar Book Club and other reading things I haven't managed it yet. I'm sorry. I really like that book.